Written during the Gulf War One, the piece Sahara Dust looks at a contracting and increasingly chaotic world, where people can wake up to find Sahara dust (rain bearing particles of sand from the Sahara desert) on their doorstep and see distant conflicts on their televisions. «This is not a time to undervalue the despair and infinite hope of small private, day to day things; we can trace the vein of a leaf or fly over vast landscapes, but what we carry with us depends on our entire personal history,» writes Lindsay Cooper. The British composer Lindsay Cooper concentrated particularly on collaborations involving text, film, dance or theatre as in the piece The Gold Diggers (with Sally Potter) or The Song of the Shirt. 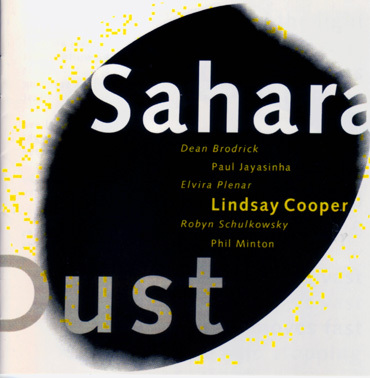 The text for Sahara Dust was written by the Australian singer/writer/director Robyn Archer, with whom Lindsay Cooper has in the past collaborated on songs, concerts, radio cabaret programms and theater productions. Die Komposition Sahara Dust enstand unter dem Eindruck des 1. Golf Krieges und wurde 1991 in der Schweiz am Taktlos Festival in Basel, Bern und Zürich uraufgeführt. Den Text dazu schrieb die australische Schriftstellerin und Sängerin Robyn Archer nach einer Idee von Lindsay Cooper. Mit komplexen Kompositionen, Jazzphrasierung, Rockmetren und einer eigenwilligen Instrumentierung erzeugt Lindsay Cooper ihren unverkennbaren Sound. Bekannt wurde Lindsay Cooper durch ihre Auftritte in The Feminist Improvising Group, vor allem aber durch die beiden feministischen Filmprojekte The Song of the Shirt und The Gold Diggers (von Sally Potter), für welche sie die Musik schrieb. 1987 konzipierte Lindsay Cooper zusammen mit Sally Potter das musikalisch-szenische Projekt Oh Moscow, das den Kalten Krieg thematisierte. Daneben spielte sie mit so unterschiedlichen Musikern wie dem Komponisten und Songschreiber Mike Westbrook oder dem Popsänger David Thomas.